As is so typical on a bank holiday weekend the weather was not great for most of it. Though it did improve for Monday and I was very surprised to see the water clear so quickly after it got fairly coloured on Saturday and Sunday with the onshore brisk winds. I was incredibly surprised to see loads of people still feathering for Mackerel in water with almost no visibility. Mackerel are site feeders, they need to be able to see the bait fish to feed on them, if they can’t see they will move to clearer water. The main catches from the weekend were Rays and Smoothound with a few Bass. I did think a few more Bass would have shown up. When the boats managed to get out yesterday they also managed to get into some nice fish. 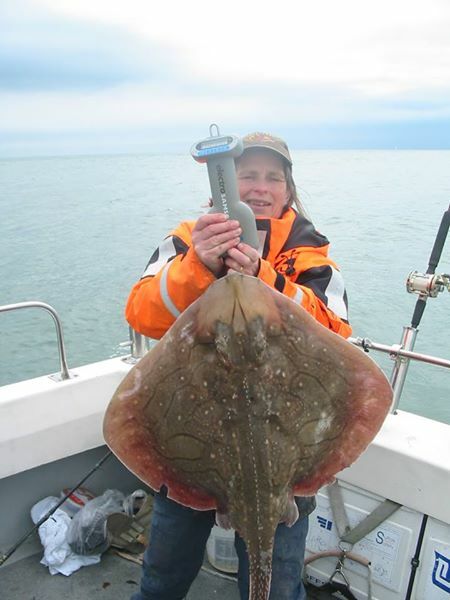 Claire who fished with me last weekend on Gypsy was out again this weekend from Poole on Our Gemma, managed to land a lovely Undulate of almost 15lb. That has made me jealous! Another contender for fish of the month. Chesil Beach: flat calm with good clarity in the water. Visibility is around 5m at the Portland end. There is some May water towards Abbotsbury. Chesil Beach forecast: The reports coming in are saying that there are some Mackerel about but they are a bit thin on the ground. The usual Dogfish and Pout will be caught after dark, but beware of the Spider Crabs. There are a lot of them around now, so baits will be robbed quickly. The Spider Crabs normally attract the Smoothounds, so it is well worth putting out a Peeler Crab bait. Lets hope that some more Rays show up. I would love to catch a double figure Ray from Chesil. Portland: Loads of Wrasse being caught and should continue to be caught in these conditions. Bait and soft plastic lures are doing well. The tides are not quite so great for Pollock but you will still be able to pick some up from dusk until dawn. Portland Harbour: A few Mullet and Bass in the harbour now. Weymouth Bay: The Thin Lipped Mullet have moved up into Radipole, so it will be a few more days and into the smaller tides before they shoal up again, but the Thick Lips are around in better numbers. Lyme Regis: Some very nice Smoothound showing on Monmouth beach along with a few nice Wrasse.